Granada offers as many as 70 places to enjoy the hot springs and practice wellness tourism, many of which are free. Read this article if you want to know which hot springs in Granada you shouldn’t miss out on. The natural hot springs in Granada have been a healing resource for ages, ever since the Arab and Romans ruled the area. Also, in some cases, they were even used in the Neolithic Era. The therapeutic quality of their waters is still sought after nowadays, for which you can spend a weekend discovering the best Natural Hot Springs in Granada province. The hot springs’ warm temperature and the high content of minerals in the water or the mud, such as bicarbonate, chlorides, sulphurous salts, chlorine and nitrogen, guarantee lots of benefits, both physical and emotional. By bathing in these waters, you will benefit from vasodilation, which stimulates the blood circulation and the oxygenation of the tissues, resulting in the faster elimination of toxins, and providing relief for those suffering of gouts and arthritis. Besides, if you suffer from dermatitis, the combination of heat, humidity and minerals is a great way to stop the hitching. Likewise, a bath in the hot springs stimulates the secretion of the endocrine glands and an overall improvement of the digestive system. Also, know that the year’s best seasons to make the most of these natural spots are autumn and spring, even though in winter the contrast between the warm waters and the cold temperatures creates a fairy-tale landscape of clouds of vapour. Surrounded by olive yards, in the semiurban park of Dehesa de Santa Fe, find the hot spring of Santa Fe (also known as Aguas Calientes), only 20 km from Granada. Its temperature reaches 40ºC, and the water contains high levels of calcium, magnesium and sulphates. Bathing here is recommended to those suffering from eczemas and acne, as well as inflammations of the musculoskeletal system. The Termas de Santa Fe is composed of a 15mt-wide puddle that drains into other split-level pools. This generates waterfalls and vapour clouds, which you can enjoy for free all year round. This natural pool appeared when the level of Reservoir Negratin lowered. It’s a gorgeous, 30mt-long pool with turquoise, sulphurous waters flowing from Mount Jabalcón. The waters are so helpful for skin diseases that they were even praised by Roman author Pliny, the Elder. 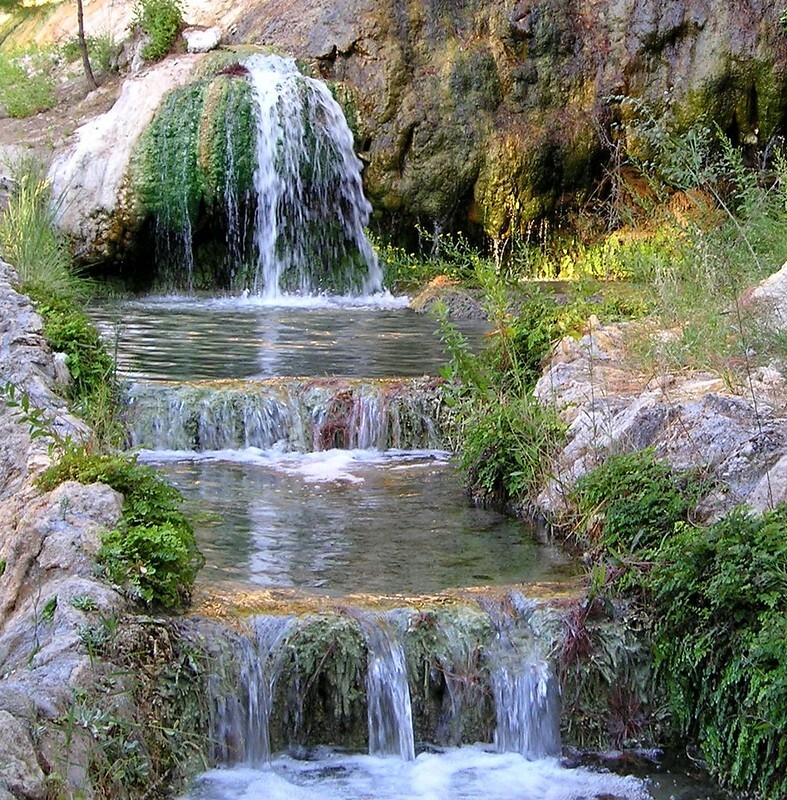 The hot spring of Zújar lies 110 km from Granada, and you can visit it Tuesday to Sunday, 10 am – 8 pm except for November, December and January. Access is free, and you can use the nearby installation provided with a restaurant and a swimming pool for €2. The Baños de Urquízar find themselves 3 km from the town of Dúrcal, in the valley of Lecrín. They are divided into Baño Grande (or Bacamía) and Baño Chico. These pools have been preserved in the most unspoilt conditions ever since the Arabs used them to work esparto and linen in the 15th century. It’s fairly easy to get to the hot spring, despite them not being visible from the main road. Near the Hermitage of San Blas, at the end of the urban centre of Durcal, you will see a signal indicating “Aguas medicinales” (Medicinal Waters). A paved lane will lead you through orchards, cliffs with staggering views and rocky walls from which the springs flow; the path brings you directly to the baths. First, you’ll find the Baño Grande (a 20 sq-mt pool), and then the Baño Chico (which you can reach by car), provided with two smaller pools. Water flows at 24ºC, thus ensuring a relaxing bath for anyone who wants to enjoy the hot spring for free. The carbonated waters of this hot spring, flowing from the Sierras de Montilla and La Encantada, rely on a constant temperature of 19ºC and their water level is 180 litres/second. This pool lies 3 km from Huéscar, in a reservoir which has been converted into a leisure area: grass areas where you can sunbathe, sanitary services, swings and even a tennis court are the facilities provided in this hot spring. Note that Fuencaliente de Huéscar get especially crowded in summer, mainly because it’s completely free. 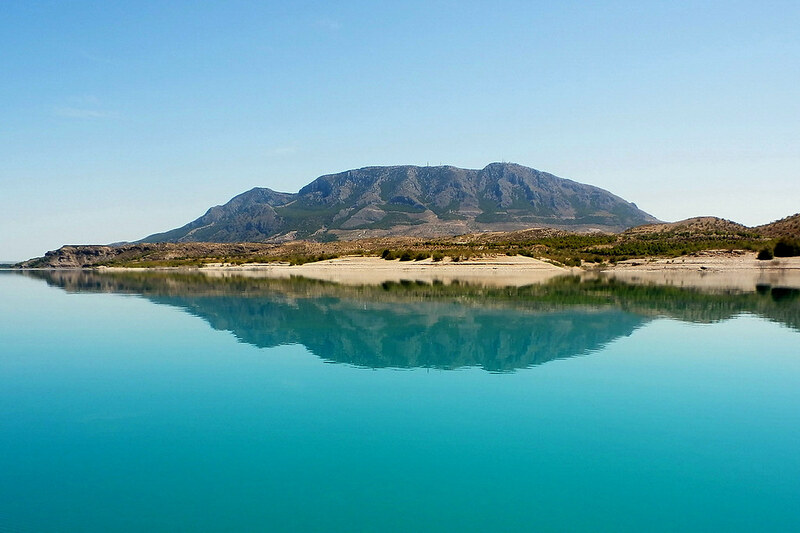 Located only 2 km from the town of Orce, you can visit this hot spring year-round for free. Its waters rely on the high content of alkaline minerals and flow at a constant temperature of 21ºC. 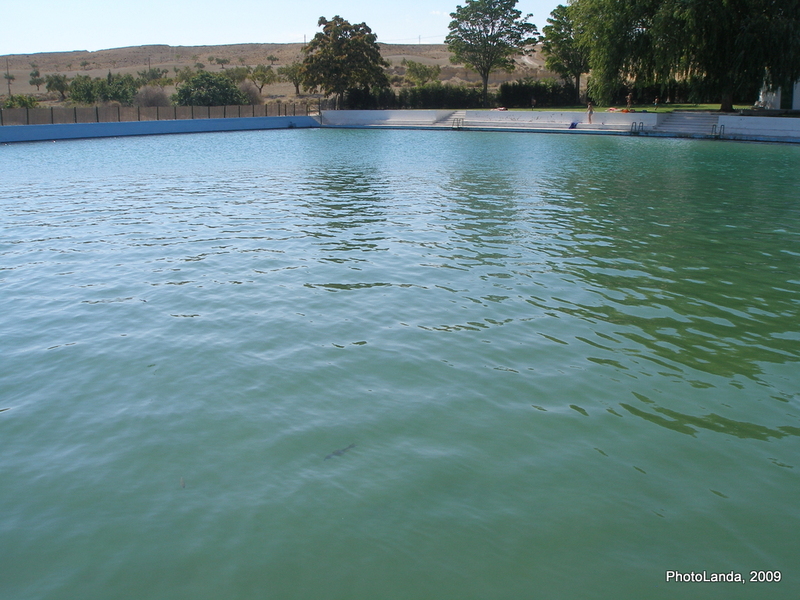 The pool is characterised by a complex eco-system, populated even by goat fishes. A leisure area is located near the hot spring, with grassed areas, olm oaks and willow trees. Private parking, a BBQ, a chiringuito and sporting areas with mini-basket and tennis courts are also available. Located between Malaga and Granada, this town has been populated since Prehistory, thus guaranteeing the town has a special cultural richness. Likewise, the town is so much related to the hot springs that its very name comes from the Arab “Al Hammam”, meaning “The [Arab] Baths” or “Hot-water Natural Spring”. To three natural hot springs, which provide 42ºC water to the spa in Alhama de Granada, are Baño Viejo (the most important one), Baño Nuevo and the natural spring of Huerta Rodero. These three natural springs, in addition to being used in the spa, also create three pools that are accessible for free. Just remember that the water cools down as it gets away from the hot spring. The Baño Viejo is located in an Arab Bath built during the Nasrid kingdom; the Baño Nuevo welcomes the Baño de la Reina (the Queen’s Bath), which is named after Queen Isabel the Catholic. The peculiarity of this bath resides in the fact that it started providing hot water following an 1884 earthquake. The Baño Nuevo is located inside the Balneario de Alhama (the town’s spa). As a curiosity, these hot springs are located near two Neolithic settlements, Cueva del Agua and Cueva de la Mujer. You can reach them after a half-an-hour stroll along the lush natural park of Sierras de Tejeda, Almijara and Alhama. Find out all the treatments you can enjoy at the spa by clicking here. This hot spring possesses various installations that provide a variety of technical and therapeutic resources. It’s located in a protected natural environment, near the megalithic park of Gorafe, where you will find dolmens and petroglyphs. The spa offers indoor and outdoor swimming pools, relaxing treatments and therapies to treat the musculoskeletal system, respiratory system, digestive system, skin and urinary system. You can access the spa, which lies 10 km from Granada, from June to September, via the bus line 225. The spa features four outdoor pools with hydrothermal jets, whose temperature reaches 32ºC. Their healthy properties (physiotherapy and anti-ageing treatments are available) and their constant replacement ensure a truly relaxing experience. Besides, the spa installation also relies on a restaurant, parking, child-friendly area and it’s adapted for people with reduced mobility. You can even take a guided tour of the cave from which the water flows. The 10-mt-deep cave is characterised by a staircase and galleries carved in the rock, where the old spa installations used to be. The guided tour costs €1.50 and is available on Saturdays, Sundays and Bank holidays at 5 pm. Andalucia’s hydrography is the Iberian Peninsula’s most generous for what concerns the hot springs. And among them, the hot springs in Granada are Andalucia’s richest and most abundant, as they contribute to improve your health and broaden the touristic possibilities of the area. To make the most of them all, book a holiday villa in Granada province. 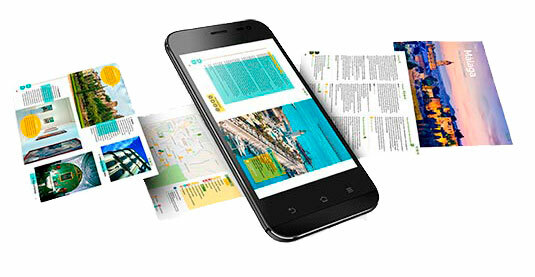 Check them out and find the one that meets your criteria by clicking on the button below. Have you ever been to a hot spring in Granada (or anywhere else in Andalucia)? Tell us in the comments below!